20 cm long (8 inches). 10 cm tall (4 inches). 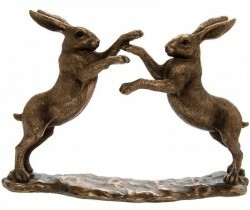 Solid Cold cast resin bronze hare sculpture with wonderful detail and high quality finish. These sculpture ornaments make great gifts, and are fantastic to display as a part of a collection or as a centre piece.